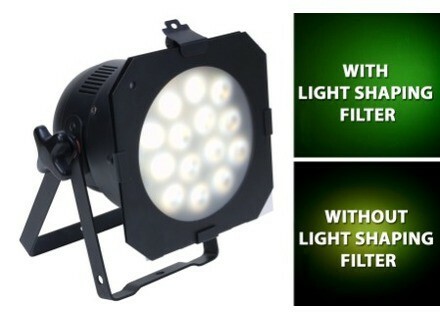 Light Shaping Filter, Other Lighting Accessory from Elation Professional. 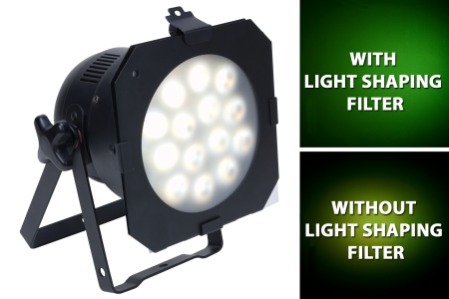 The new LSF series ("light shaping filters") from Elation is designed to give any LED fixture a wider beam angle. LED technology offers lighting users many advantages, such as energy efficiency, low heat, low maintenance and the ability to perform RGB color-mixing. But many LED fixtures also share something else in common - a narrow beam angle or uneven field of light, which can restrict them from being used for certain applications such as stage or wall washing. Elation Light Shaping Filters attach to a gel frame or the inside of an LED's casing to add 10°, 20°, 30° or a linear beam shape effect to its beam angle that's ideal for stage or wall grazing, without requiring complicated or permanent alterations to the fixture. Elation Light Shaping Filters are available in four different beam angles: 10° LSF10-24), 20° (LSF20-22), 30° (LSF30-24) and 60°x1° (LSF601-24). With the first three versions, the beam angle is widened both vertically and horizontally - say 10° in both directions. The 60°x1° version broadens the angle 60° horizontally and only 1° vertically, making it great for long, flat wall washes. As an example, Elation put a 60°x1° filter on two LED par cans, spread them out approximately 4' on center and covered a 10' area of wall with the two fixtures, creating an ideal setup for up-lighting applications. Light Shaping Filters can be used with LED fixtures made by any manufacturer, not just those from Elation. The filters come in large sheets, allowing users to cut them in the sizes needed. Each sheet measures 24"x 24" (except the 20° version which is 24"x 22"). If outfitting a 6" LED par can, for example, 16 filters could be cut from a 24"x 24" sheet. For more information, call Elation Professional visit www.elationlighting.com. Chauvet Legend 300E Spot Chauvet introduced two new moving head fixtures to its Legend Series. Chauvet 4PLAY The 4PLAY is designed to provide a "ready-to-go light bar for the performer on the go." American DJ Dekker LED The Dekker LED from American DJ is a DMX-512 LED effect, designed to project red, green, blue and white beams from a grid of lenses that runs 5 high and 8 wide - for a total of 40 lenses in all.